At Commonhealth, Rachel Zimmerman describes an amazing encounter with a pediatric doctor at the emergency room. He was interested in how the wound was healing, but also about her experience in the ER — her memories and the language she used to describe the treatment. Honestly, I said, she loved it. She said she would go back to the hospital any time. After our conversation, I hung up thinking this guy is too good to be true. So, why aren’t all medical interactions this way? Why isn’t pain reduction, particularly for children, a priority for all doctors? It's a terrific story for a bunch of reasons. It starts with the doctor's interaction with the kid, which is Heartwarming. Then it gets into what techniques the doctor actually used to comfort the kid, which is fascinating. And then seeing how the doctor approached his work, it is also a story about mastery of a craft. It turns out that in addition to the Internet Movie Script Database, there's a comic book script archive. One of these days I need to write at length about the relationship between Christopher Nolan's Batman and Frank Miller's Batman ... and how the latter turns out to be disconcertingly fascist. In the meantime, I have a close reading of Frank Miller's The Dark Knight Returns , which does some great stuff with the formal elements of the book. The Stumbling and Mumbling blog has a witty libertarian argument about administering a welfare state. Someone just pointed me at this nifty little graph about the New Deal and the Great Depression. It's from a short article about conservative claims that the New Deal didn't help with the Depression by Charles McMillon at the Campaign for America's Future, giving a thumbnail review of the history. A good thing to have handy. 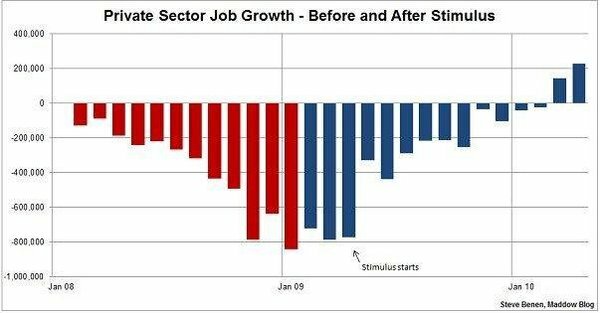 For future reference, Steve Benen at The Maddow Blog has the key charts showing that yes, the stimulus pulled the economy out of a tailspin. Plus I have a great Q & A with Michael Gruenwald, author of the book about stimulus spending The New New Deal , arguing persuasively that the money was spent more effectively than most people know. 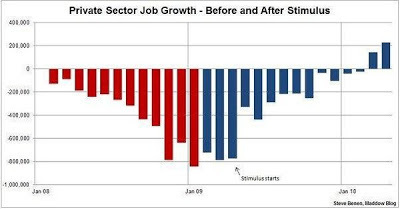 I was only vaguely aware of the Beltway consensus that President Obama’s stimulus was an $800 billion joke. But because I write a lot about the environment, I was very aware that the stimulus included about $90 billion for clean energy, which was astonishing, because the feds were only spending a few billion dollars a year before. The stimulus was pouring unprecedented funding into wind, solar, and other renewables; energy efficiency in every form; advanced biofuels; electric vehicles; a smarter grid; cleaner coal; and factories to make all that green stuff in the U.S. It was clearly a huge deal. And it got me curious about what else was in the stimulus. I remember doing some dogged investigative reporting—OK, a Google search—and learning that the stimulus also launched Race to the Top, which was a real a-ha moment. I knew Race to the Top was a huge deal in the education reform world, but I had no idea it was a stimulus program. It quickly became obvious that the American Recovery and Reinvestment Act (the formal name of the stimulus) was also a huge deal for health care, transportation, scientific research, and the safety net as well as the flailing economy. It was about Reinvestment as well as Recovery, and it was hidden in plain view. For future reference, the pivotal three minutes from the second Obama-Romney debate. Jonathan Chait at New York magazine has the most striking article about Washington politics I've read in quite some time, arguing that this election matters in ways that I hadn't imagined. It seems natural to conclude from all this vapid, buoyant patter that neither candidate has a plausible blueprint to avoid political gridlock, and that, whoever wins, the stalemate of the past two years will grind on into the next four. President Obama would still likely face a Republican House, and President Romney a Senate in which Democrats can mount a filibuster. Yet all the signs suggest both candidates do have strategies in mind to prod the creaky machinery of Washington to life and effect the dramatic change they vaguely but ardently promise. In fact, shortly after the next Inaugural Ball—perhaps very, very shortly after—the great stalemate between socialism and social Darwinism will break open and likely turn decisively in one direction or the other. For different reasons, the candidates cannot openly describe these plans to the voters. But the clues are everywhere. You might surmise from all this that Obama is simply living in a dream world. That is the conclusion drawn by several of the smartest liberal political analysts I know. I have a different conclusion: Obama does have a plan to break the legislative impasse and settle the long-term struggle over the scope of government. It does not rest on the GOP’s coming to its senses and thinking of the national good. The plan is the very opposite of naïve. 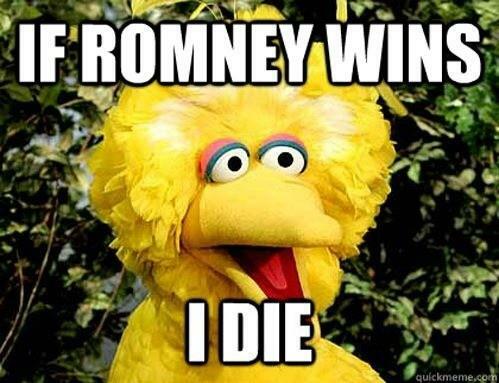 And he can put it into effect even more quickly than Romney could enact his own plan. There's a lot that Chiat predicts that I find troubling and disappointing, but I hope that at least that much is true. Zach Snyder, director of 300 , Watchmen , Sucker Punch , and the forthcoming Man of Steel , has a terrific eye but a shallow mind. His adaptation of Watchmen is exactly the soulless, ham-fisted misinterpretation of Alan Moore and Dave Gibbons' novel which I might have made had you put me in the director's chair when I was nineteen years old. His adaptation of 300 managed to take the implicit fascist sensibility of Frank Miller's novel and make it worse. A while back, I succumbed to curiosity and caught his film Sucker Punch , a stylish, bizarre mishmash that's sort of about hot chicks in fetishy outfits getting into cartoonish action movie battles ... and sort a horror story about a young woman trapped in an insane asylum. It is a strange film. It is not a good film. Sucker Punch is nothing more than a steaming pile of maggot-filled, festering, misogynist crap trying to masquerade as female empowerment. Snyder is nothing but a parasite trying to leech of the gains of feminism to satisfy his own personal, pornographic, adolescent boy fantasy, which just serves as another example of the male driven backlash against women. I understand and respect the heck out of that reading. It's an easy conclusion to reach, given the film. And obviously I have no love for Snyder. But I think that it's dead wrong about his intentions. It was vividly apparent to me, seeing the film, that Snyder was sincerely trying to make a film critical of the misogyny it manifests ... but utterly failed at that project due to his limitations as a filmmaker, his male privileged boneheadedness, and his general stupidity. Now even if I'm right that Snyder had some positive intentions, I don't want to claim that the good intentions I imagine for him redeem the film. They don't, either in terms of its sexism or even as an artwork. But if we do want to talk about the film Snyder was trying to make — and I think that is a conversation worth having — then we should get it right. Indeed, if I'm right that Snyder was trying to make an actual feminist statement but screwed it up and produced the opposite, it should be very interesting to talk about the disjoint between the intended effect and the actual effect. I've never had the patience to try to assemble the argument about the movie Snyder was trying to make. So it's a good thing that Bob “MovieBob” Chipman at The Escapist has come along and done it much better than I could have. If you have ever suffered the misfortune of seeing Sucker Punch , I cannot recommend highly enough checking out what MovieBob has to say. And if even if you haven't, you may want to look at Mr Chipman's work in general. I'm a fan. It's a sentiment I've always loved. 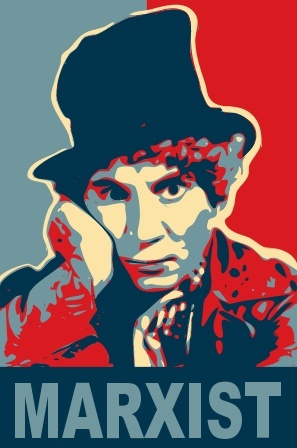 A friend observes that her Marxism is more tendance Harpo, so I made this image for her at ObamIcon.Me; where I've also made a few other images. I love that he punctuates like he talks. I cannot resist hearing his voice reading is comments in my head. Between a half and a third of everything that we try, we’ll go out, we’ll get the tape and then we kill it. You know, you thought it was going to be good. You went out, you did the interview, the person wasn’t such a great talker, they weren’t so funny, they weren’t so emotional, somehow when they told it to you in person with the camera it wasn’t the way they told you when [you] talked to them on the phone beforehand, they just got a little intimidated with the camera. Just something in the chemistry was wrong, you can’t even name what it is and why you’d even bother to try. But then when you look at the footage you know that there is a feeling that you had about it, which isn’t in the footage, right? But then, it’s time, at that point, to be the ambitious, super-achieving person who you’re going to be and kill it. It’s time to kill, and it’s time to enjoy the killing because by killing you will make something else even better live. And I think that not enough get’s said about the importance of abandoning crap. All video production is trying to be crap. It’s like the laws of entropy. Anything you put on tape is trying to be really bad, much like the sentences I’m saying here. And another variant on this theme has been captured in a little video which has been well-circulated. 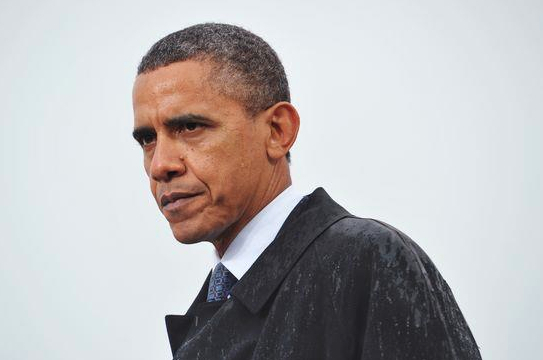 A friend circulated this photo of the President on Facebook today, and I'm posting it here so I can find it again. It's an incredibly arresting image; my friend said that he looked like Lincoln. Something tells me that history will remember this Obama more than the one we were hoping for. Boy, James Fallows of The Atlantic called it. Robert Kuttner of the progressive magazine The American Prospect expressed dismay at Romney's clear victory in the first Presidential debate last night. This is the Obama we saw in 2009 and 2010 — an Obama reluctant to be too partisan or too aggressive, a diffident Obama, above the fray. Romney went for Obama’s throat, and he managed to do so without seeming mean. Obama not only took the assaults, but failed to maximize the several openings that Romney gave him. Chris Matthews said much the same in a rant on MSNBC right after the debate. I have no love for him, since most of the time he embodies the worst news media conventional wisdom, but that makes his reaction to the debate that much more striking. Like Kuttner, he read Romney winning the debate with nonsense, and Obama letting it slide. Time will tell if the general news media does anything with how much deceitful BS Romney employed during the debate. Progressive website ThinkProgress has a good rundown of Romney's numerous use of “myths” and FactCheck.org has a more detailed review in which Romney and Obama both get called out — but it makes clear that Romney's bogus statements are both more numerous and more egregious. And they have a whole article about Romney's favorite canard of the evening: that Obamacare “cuts $716 billion from Medicare” to pay for itself. Republicans claim the president’s $716 billion “cuts” to Medicare hurt the program’s finances. But the opposite is true. To some voters, it may sound counter-intuitive at first to think that cutting money from Medicare would improve, not weaken, its finances. But, again, this is a reduction in the future growth of Medicare spending over 10 years. As Greg Sargent at the Washington Post points out, Romney does this because he has to. The bottom line is that, for all his success last night, Romney remains burdened by a deeply unpopular agenda. That’s why he relentlessly distorted and obfuscated the true nature of that agenda last night. And let’s face it: He pulled it off brilliantly. The question is whether the Obama campaign can, in upcoming debates and through TV ads, cut through the haze produced by the Romney campaign’s fog machine of dishonesty and reveal Romney’s true agenda to voters. And who knows — maybe the news media will have a crack at doing this, too. Another seeming missed opportunity for Obama was Romney's “47%” comments, which Obama didn't bring up at all. Many commentators asked why not; David Corn at Mother Jones has a quote from an unnamed Obama campaign strategist explaining why. Not that we won't talk about it again. We will. But most compelling: hearing it from Romney himself. We've got that on the air at a heavy dollar amount in key states. And it's sunk in. Interesting. I've seen one of those ads, composed entirely of clips of Romney, and it is devastating. Jonathan Chiat at New York Magazine sums up Romney's successful strategy. Tonight’s debate saw the return of the Mitt Romney who ran for office in Massachusetts in 1994 and 2002. He was obsessive about portraying himself as a moderate, using every possible opening or ambiguity — and, when necessary, making them up — to shove his way to the center .... he dodged almost every point in the right wing canon in a way that seemed to catch Obama off guard. Romney added little to his longstanding indictment of Obama, but defined himself far more effectively than he has before. But Chiat also notes that Obama did land a some important punches. And Romney did make one big unforced error, not only pledging to cut PBS but directly taking on one of its most popular stars. In another post Greg Sargent at the Washington Post offered a good overview of the consequences for the Presidential race. Romney had the far better night. The question is whether Romney accomplished enough. He needed to change this race in a very fundamental way. Romney won, but in so doing, he confirmed yet again that his campaign thinks he can win the election without presenting any credible policy agenda of his own. That’s what he really needed to do to alter the basic trajectory of a contest that Obama is currently winning. It was unquestionably a good night for Romney, but it’s unclear whether it will produce the big change he needed. Charles P. Pierce at Esquire sums things up similarly, in the best comment I've seen so far. If you only follow one of my links, follow that one, and read the whole thing. Not only does he review Obama's tactical errors, Romney's trickery, and the consequences for the race, he takes a step back and looks at the implications for American politics in general. The narrow range of debate at that debate bodes ill.
Willard Romney was able to portray himself as a firm, principled national figure of what passes for the rational center. I didn't think that was possible. What happened on Wednesday night — what the president allowed to happen on Wednesday night — has changed this entire election. What you saw, I think, anyway, was the end product of the president's consuming naivete as regards the American political process, as well as the end product of thirty years of a Democratic Party that has slid so far to the center-right that a Democratic president found himself arguing with a “severely conservative” Republican candidate over the issues of how much the Democratic president had cut out of the budget, how many regulations he'd trimmed, how much more devoted to the middle-class-kick-in-the-balls Simpson-Bowles “plan” he is, and how he would “reform” Social Security and Medicare — and, frankly, a Democratic president losing some of those arguments to his left. A Democratic president got through an entire debate and didn't mention unions at all, even though the fact that our teachers are unionized here in Massachusetts is a big part of the reason why Romney got to brag on how good our education system is. And that was why it took me a strong dose of whiskey to get through the debate. It demonstrated that Obama has no stomach for standing up as a champion of progressivism ... which puts the left completely offstage in mainstream discussion of American policy. Update: David Atkins at Hullabaloo suggests a debate thought experiment relevant to the question of “media bias”.